A middle-aged Melbourne cat burglar broke into the homes of wealthy people and stole jewellery and valuables, including a $60,000 watch, to pay debts owed to people he met at the casino. Chinese-born Di Miao, 54, pleaded guilty today to four burglaries at homes in Melbourne&apos;s affluent eastern suburbs over several years, sometimes wearing a black wig as a disguise. But Miao&apos;s lawyer says the burglaries were far from being the work of a "Pink Panther-like" master thief and were rather the "clumsy" crimes of a desperate single father. Di Miao pleaded guilty today to four burglaries at homes in Melbourne's affluent eastern suburbs over several years. The 54-year-old stole the goods to pay back debts he amounted at Crown Casino. 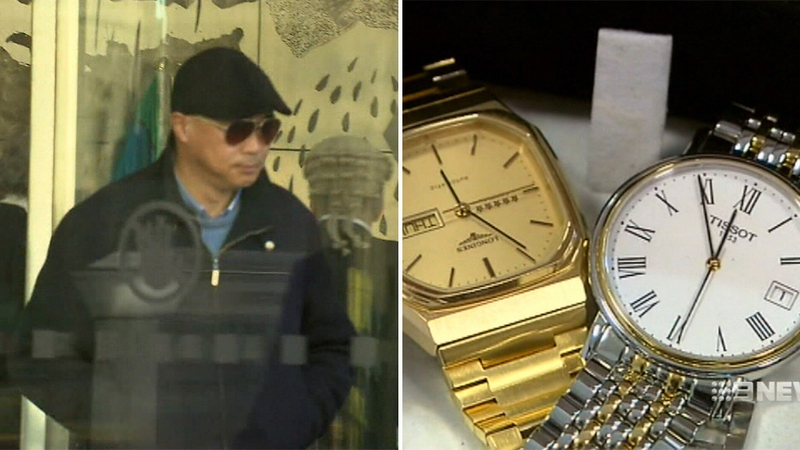 A cache of stolen goods, including a watch worth $60,000, were found at Miao's home. After a lengthy investigation, DNA evidence led police to search Miao&apos;s Doncaster home in early 2015 when they found a "plethora" of luxury items stashed throughout. The valuables ranged from jewellery and handbags to electronics and rare alcohol. Detectives also found passports concealed in Miao&apos;s pants during that search, and uncovered a bag containing a wig, gloves, a torch and a knife. "He said they were for Halloween," prosecutor Temple Saville told a pre-sentence hearing in the County Court. Miao was asked how his DNA was found at a number of burglary scenes and at first replied: "It must have got there by magic". He was initially charged with more than a dozen break-ins but in a plea deal he eventually admitted four burglaries between 2012 and 2015. Miao also pleaded guilty to two thefts related to the burglaries and recklessly dealing in proceeds of crime. The items he stole include a Swiss-made rose gold Constantin watch worth $60,000, a diamond-encrusted gold bracelet and $10,000 cash nicked from a jacket pocket. Defence lawyer Matthew Page said Miao&apos;s burglaries were unsophisticated and committed in desperation by a debt-saddled klutz. "He is not a glamorous cat burglar," Mr Page said. "He&apos;s a middle-aged man who was drowning in debt and clumsily committed some burglaries. DNA tied the burglar directly to the crime scenes. Miao will be sentenced over the robberies on Friday. "As a result of his stupidity, he&apos;s missed saying goodbye to his father who died in China." That clumsiness Mr Page referred to involved Miao drinking from a water bottle at one scene and spilling blood at another, leaving DNA behind. At the time Miao was a single father with a teenage daughter and had mounting debts owing to other Chinese people he&apos;d met while gambling at Crown Casino. "It&apos;s fair to say the interest rates on these kinds of loans are higher than one would find at a bank," Mr Page said. Mr Page said Miao had borrowed the money to support his travel agency business and was not a problem gambler. Miao is on bail and his lawyer is pushing for a community-based sentence, but prosecutors want jail time. Judge Susan Cohen will sentence him on Friday.